Dublin is now the most popular post Brexit location for UK firms over its European peers (Frankfurt, Luxembourg and Paris) in terms of company moves (not staff numbers) according to the latest EY Brexit Tracker. 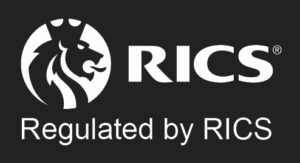 This is despite the perception that the city has lost out to its competitors due to the erosion of competitiveness, lack of residential rental supply, a cautious regulator and limited infrastructure. 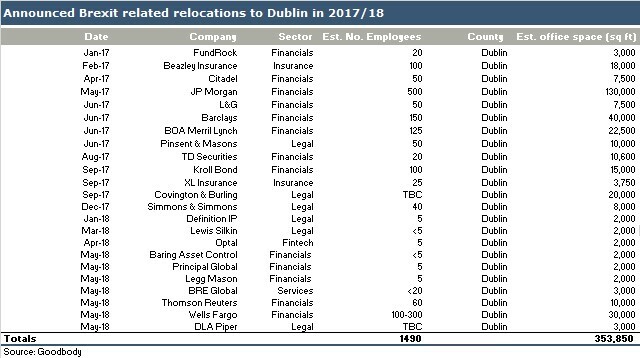 The EY Brexit Tracker found that 21 firms (we have broadened the definition and have identified 23 firms) have confirmed they will shift some or all of their operations to Dublin. This places Dublin ahead of Frankfurt, with 12 firms, Luxembourg with 11 and Paris with 8 firms. Since the Brexit referendum two years ago, 23 companies have confirmed they are relocating to Dublin due to the UK’s pending departure from the European Union. This is only a fraction of total occupier demand in the Dublin office market and would compare to less than 10% of total take up in 2017. 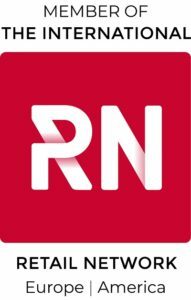 – 100% of announcements have been for the Dublin region. A further 17 firms are noted as planning to increase their presence within Ireland due to Brexit adding at least 1,000 employees to their Irish operations. Such expansions are likely to create demand for a further 200,000 sq ft of office space. The emerging consensus is that Brexit will not play a significant role in driving office rental growth in Dublin, with existing take-up patterns (Tech dominated) continuing to dominate. Nonetheless, the city has sufficient office space capacity and developments in the pipeline to deal with this additional channel of demand. Furthermore, such moves are welcome in diversifying the occupier base of the Dublin office market and add to an already strong demand base. This is evident in our analysis on estimated office space requirements for the publicly announced moves over the last two years.